the holiday will always fit snugly into the November sweeps period. Until “Thanksgiving III,” this was not a prospect that thrilled me. “Thanksgiving” and “Parents” aren’t bad episodes of New Girl—they just fell short of their potential. There’s a lot of inspired silliness in the Parent Trap subplot of the latter (not to mention Jake Johnson’s too-hot-for-TV flirtations with Jamie Lee Curtis), but I recall feeling ultimately let down by the episode last year. On its first two Thanksgivings, the show was distracted—by guest stars, by love interests, by inappropriate uses of home appliances. “Thanksgiving III” removes all frills (and most modern conveniences) from the equation, and turns out the best New Girl Turkey Day ever. For once, the holiday plays toward the show’s strengths: its principals. In that spirit, this episode absolutely mashes the “We’re a family” button of Josh Malmuth’s script. It’s an overplayed sentiment for TV Thanksgivings, but not a point that’s been well made within New Girl’s previous treatments of the holiday. And it’s an increasingly important one to enforce as the characters grow up and move out of the loft. The core cast is stratifying across fake Los Angeles, a fact of life New Girl has always demonstrated confidence in handling. (Even when that decision rings false, as in the first-season finale, “See Ya.”) With the gang in flux, it’s important for “Thanksgiving III” to illustrate that they’ll always be around to pull two of their own out of Chekhov’s bear trap. It’s a nice capper on what’s been the dominant theme of the season’s first half: If Nick is changed by his relationship with Jess, is he losing himself? It’s an important question to ask, since Nick has been the most consistently enjoyable part of the show for the past season-plus. As critics, viewers, and critically thinking viewers, we jones for character development from our ongoing series, but we still want to recognize the parts of those characters that made us care about them in the first place—a concern that comes from the same place as what Coach articulates to Nick at the top of “Thanksgiving III.” What someone like Coach perceives as Nick “softening” is actually just Nick evolving, and he spends the rest of the episode asserting that he’s just as easily agitated and impulsive as ever. That’s why he ends up in that bear trap: No matter how many positive twists and turns the New Girl writers throw at Jess and Nick, so long as he keeps leaping before looking (especially when historical facts or scientific truth is involved), they won’t lose touch with the core of the character. I’m still waiting for the show to treat Jess’ side of the romance with the same precision and focus, but “Thanksgiving III” does a little bit of work toward that goal. It’s her overzealousness and commitment to Nick that gets the best of her here—basic character traits that keep the episode tethered when it spins off into food-poisoning crazy town. I’m not wild about Jess’ fish-drunk sojourn through the woods, but the emotional grounding combined with the mundanity of her hallucinations (“I’m out of the office ’til Friday, for immediate assistance, please call Deb at extension A.C. Slater.”) gives that gag a big lift. Besides, it leads to Nick helping his girlfriend to get what she wanted out of Thanksgiving, too, and that’s a sweet undercurrent for the episode—and one that demonstrates the two-way street of their relationship. There have been some ups and downs in these first 10 episodes of New Girl’s third season, and I understand how that might inspire some uncertainty among the fan base. But “Thanksgiving III”—like some of the other, back-to-basic New Girls this season—plays like a confirmation that the show is growing while still remembering what made it special. Having Coach around is drawing the competitiveness back out of Schmidt, which is important because he can only be his own adversary for so long. Within the ensemble, Hannah Simone’s stepping up more as a utility player—I really like what she and Lamorne Morris do tonight in the roles of the most reluctant of the reluctant campers. It’s not the most uproarious episode of the third season, but I really like where “Thanksgiving III”’s heart is at. 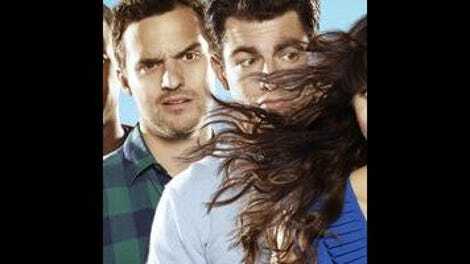 Thanksgiving tends to indulge New Girl’s slapstick impulses, and that’s certainly true of “Thanksgiving III,” an episode in which Jake Johnson dives head-first (cue Winston: “Why?”) into a pit and Max Greenfield has a prop boulder slammed onto his back. But it’s also a refreshingly warm dispatch from a season that’s often shouted its feelings, tapping into the emotional honesty that marks the show’s departures from its house style. The camping trip is the type of overcompensation we’ve seen from Nick before, an attempt to work around his issues with Walt and find the Ernest Hemingway within. But even Hemingway had women in his life (probably too many women) who made him feel giggly after three beers. It’s all part of the process—practically year-long at this point—of showing that the true Nick Miller is the one who doesn’t feel the need to overcompensate. And in fitting with his original plan, he makes this discovery about himself in the wilderness. 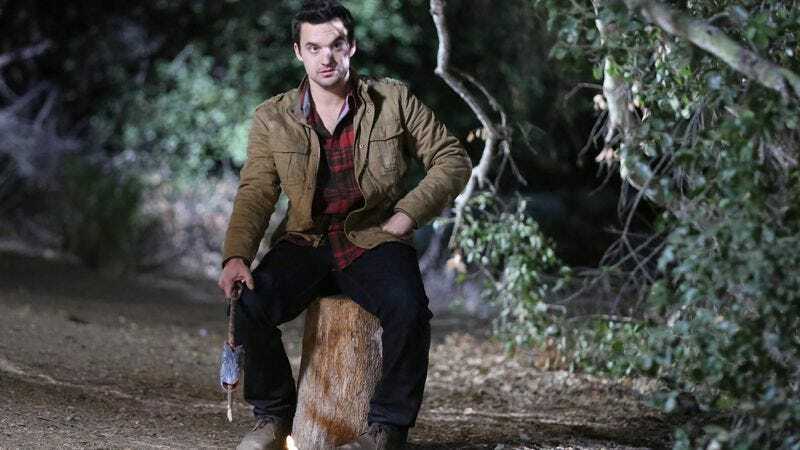 It’s an appropriate way to bid adieu to New Girl’s often great, usually good 2013: The show goes on a nature retreat and gets in touch with family and its primal self—and some nasty-sounding parasites, too. This is the last new New Girl review of 2013, but it’s not the last you’ll be reading about it on the site in 2013. STAY TUNED. This Thanksgiving, raise some eyebrows—give ’em Snack! Max Greenfield describing Schmidt’s Hidalgo is Todd VanDerWerff’s new favorite New Girl joke. I guarantee it.